Join Mother Angelica on a penetrating tour into the sacramental life of the Church. In these pages, Mother Angelica will lead you to discover the spiritual secrets embedded in each of the seven sacraments and how those secrets can help you live the sacramental life to its fullest. Mother Angelica combines the personal reflections of a saintly life with the teachings of a master catechist, providing you with a spiritual handbook that will help you get more out of Holy Communion, expose you to the grace God desperately wants to give you in Confession, the beautiful gifts found only in the Sacrament of Matrimony, and how you can enter into the mystery of Christ in Adoration. Written while embracing the charism of her order which is Adoration of the Blessed Sacrament, you'll notice that the words written here are unmistakably Mother's work, but also unmistakably the work of the Holy Spirit. If you want to understand the many gifts God is offering you through the seven Sacraments, there is no better guide than this book by EWTN's foundress, Mother Angelica. 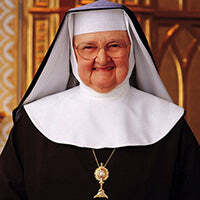 Mother Angelica was a Catholic American Franciscan nun best known for her television personality. She was also the founder of the internationally broadcast cable television network Eternal Word Television Network (EWTN) and the radio network WEWN.